Can I copy a creature with Sculpting Steel that's been petrified? Can I make a token of a copy? First thing that comes to mind is Rings of Brighthearth . Only thing better than copying abilities is copying them twice! Plus it’s redundancy just in case tawnos gets hated out. 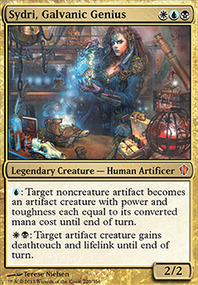 You might also consider Phyrexian Metamorph to copy an artifact you like. Sculpting Steel as well. Reckless Fireweaver might provide decent drain value since you have so many artifacts as well. I’ll post more as I think of them. Hope this helps! Great start so far! Oh man, Mirage Mirror . No need to sell me on that card honestly, it's great. The only reason it's not already here is because I've neglected to update this list in a while because I hadn't been able to play much the past couple years. That absolutely needs a spot. I forget it can copy lands, so it can actually be a third way to pull off a sneaky Dark Depths combo if need be as well. That's pretty sweet. I've run Mindslaver before here, and I ended up cutting it. It's fun, but I needed the spot for Kaladesh tech. Clutch Emrakul, the Promised End casts have won games for me before though. Helm of Awakening is pretty gnarly, I may have to test it and see if I can't make it work for me. I'm just not a fan of symmetrical effects. As for the 100 Strip Mine s, I put 100 there because it wouldn't let me add a million. "You really need 1000000x Strip Mine, huh?" YES I DO TAPPEDOUT, MAY I PLEASE HAVE THEM? I figure if I keep that there for long enough, I will eventually get at least one. I could use a sell on Tangle Wire . I like it, and I bet I could get it past my group, but how do I break parity with it? Clock of Omens kind of things I would guess? I mean, I guess tapping the Wire to itself is a cheeky cheat, but you seem to know something I don't that makes it go from good to incredible. As for your puzzle, hell, challenge accepted. I too am a fan of Rube Goldberg machine plays. Proceed to generate literally a googolplex of mana. Because overkill. I'm not sure if you had a way to actually end the game proper from there in mind but this is what I came up with. One player has no deck, and the rest have no boards, so realistically everyone scoops and the hypothetical players here probably never play with me again. God I love colorless. PlasmaBeam on Do you like to draw cards? 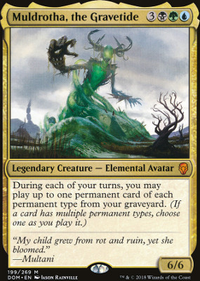 emotley Problem with Metamorph is that it is 3 mana and 2 life. Normally life is irrelevant so that can be obviated. I haven't played metamorph enough to give a fully informed opinion, but this list tries to be as lean as possible, cutting cmc where possible to make it as fast as possible. Most of the time paying 1 more won't affect you, but there will be games when you want to copy artifact a rock on 2 to play Jhoira on 3 and then sit back. End line is, metamorph is fine but slower than copy artifact. 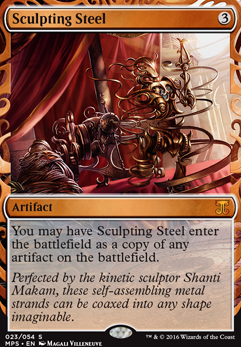 If you want the same effect for cheaper and not pay 2 life you might want to look at Sculpting Steel . Of course, Metamorph copies creatures and if it copies one of your reducers, well, chances are you'll be winning pretty soon! kmnop Words of wind and all the cEDH fast mana: Mana Crypt, Mana Vault, Moxen. Bounce effects are very cheap, fortunately. After that, start getting the stax pieces and then get the expensive stuff like Mana Drain/Force of Will. If you want, you can play the KCI version that is easier on the wallet but way more fragile while you build up to the Staxy one. Well Serum Visions is actually a good idea, I was already thinking of adding some. 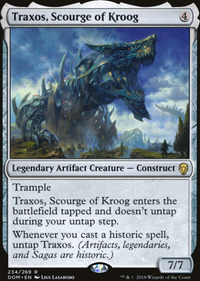 For Scourglass I feel that it's a really important card as it removes all permanents except for terrains and artifacts, therefore it is useful against decks that use planeswalkers and enchantments too, the only downside being that I have to wait a turn before it becomes effective. It is also my principal way of making a clear path for my Lodestone Golem as they're pretty weak to chump-blocking. For counters I felt like Metallic Rebuke was a great addition as my artifacts can help paying the extra cost brought by the golem and its copies. For additionnal creatures I was thinking of Shimmer Myr so I can keep my mana for the opponent's turn and play my artifacts if they doesn't play anything that needs to be countered. It's also quite useful to play a surprise Scourglass at the end of their turn and activate it in my upkeep. 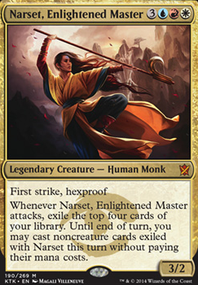 But I'm quite reticent as it still is a weak creature for 3 manas that doesn't really brings something to my board directly. I was also thinking of Sram's Expertise but it'd be weak without any lord effect. Sculpting Steel is also an option but I'm afraid it'll be too often useless because of a lack of Lodestone Golem to copy. Phyrexian Metamorph doesn't have this problem as I can copy an opponent's creature (pretty useful way to find an alternative kill, that'll survive Scourglass while the opponent's one won't). In conclusion, the ideal additions would be 2-manas artifact creatures but I can't find any (I searched through eveything that was Modern-legal) so I think I'm just gonna add some control to stall the game until I can hit the board with numerous Lodestone Golem s.
* Dueling Grounds locksdown attacks to just one Attacker & Blocker from the defending player. * Crawlspace , on the other hand... Reducing one's Attackers to me to 2, where every other attacker gets everything else seems like the better bet. Finally, should I remove Vivien Reid (Damn, I'm asking a second time...), or should Elspeth, Knight-Errant be removed as well? Finally, for real, how good/bad/ugly am I trying my all to refine my idea (Just a thought I case I have to further do this...)?